Getting worked up over Blast Ball? As in getting hyped? Because I sure am. Screw the main game, I want to play some FPS football. Just look at the success of Rocket League. Well, if you can find enjoyment in anything that has been shared, then i'm happy for you! I wish people would focus on the positives of things rather than complain about the negatives. There's too much of that. Running a Metroid community, i've pretty much heard it all. Unfortunately since Metroid: Other M the community has changed, and I have seen so many vile comments towards the Metroid series as a whole that it just makes me feel embarrassed to be a fan. However, I do understand people's disappointments with Federation Force, I know people would like to see a 'proper' Metroid title, and I don't think this is what people were expecting. Personally, I am excited to see another spin-off title, it allows me as a fan to learn more about the Metroid universe, and it will be the first co-op game of the franchise. My impressions are that Federation Force (at the time) was still in a development stage. It has most likely changed a bit since we all saw it. Remember how Metroid Prime Hunters: First Hunt looked when we first got the demo with the original DS? It reminds me of that, and then two years later we got a great looking game (for its time). In terms of how people claim this is going to be a terrible game, let's think about the people behind this project. Kensuke Tanabe is heading it, and has had a hand in all three of the Metroid Prime titles at Retro. The team behind it (Next Level Games) put together the awesome Luigi's Mansion 2. These are notable names with proven experience of making great games. In regards to Blast Ball, this is merely a fun tutorial and I don't understand why so many people have been getting worked up about this. It isn't the focus of the game, and was created to get you used to the controls of the main game. If anything, it feels like we are getting a nice bonus game instead of a boring tutorial. Tanabe-san himself said that he doesn't like tutorials, so I have no problem with this addition to the game. In short, the game is still in an early stage and it was unfair for people to treat it as harshly as they did. However, I feel that Nintendo should have waited longer before showing it off. First impressions are important and all that. While the names behind the game are no guarantee of a successful and great game, at this point in the development, this is all I can go on, and I think it's a solid reason to have some hope. 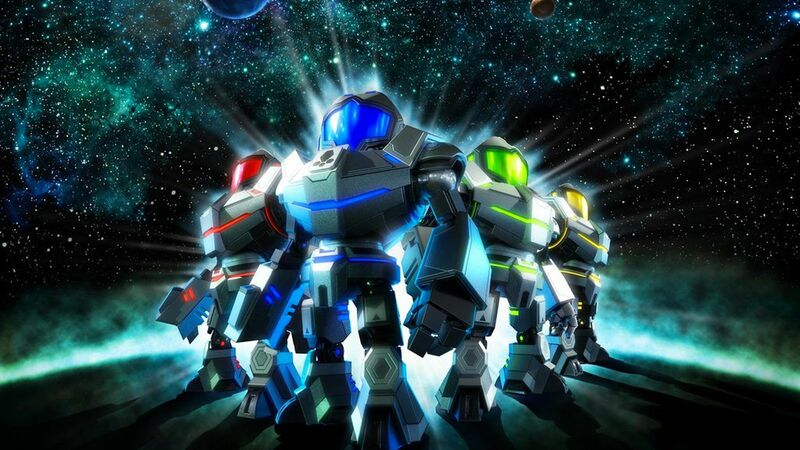 My initial thoughts on Federation Force were pretty much an instant reaction to my disappointment at my lack of a "proper" Metroid, be it 2D or 3D. I bloody love Super Metroid and Metroid Prime, so I was hoping for more of the same. Upon reflection and watching some of the gameplay footage that's come out, Federation Force looks interesting - I'm just not sure if it'll be my cup of tea as I'm primarily a single player only gamer and this is obviously multiplayer oriented. If we get a GNamer gang together though... could be a blast. Upon reflection and watching some of the gameplay footage that's come out, Federation Force looks interesting - I'm just not sure if it'll be my cup of tea as I'm primarily a single player only gamer and this is obviously multiplayer oriented. If we get a GNamer gang together though... could be blast. I loved Super Metroid, I loved Metroid Prime and of course, I would love to see another game like them in the future. But right now, this is what Nintendo is giving us, and I am going to at least check it out! I think keeping an open mind about gaming is important. If we can get a group of us onto Skype, I'll likely check it out too. I'm not one for playing with randoms online. The importance of this in the grand scheme of the Metroid story has me intrigued - with all the chat of meeting important characters, part of me thinks this might be a lead-in for a future main Metroid game. See, for me the words "meeting characters" and "main Metroid" should be kept pretty far apart. My favourite thing about my favourite games in the series is the sense of absolute isolation. Absolutely! That's one of the core aspects of Metroid. Samus is a capable young woman who can throw herself into absolute isolation and work out the puzzles and the path in front of her. I don't mind introducing new characters but for the most part...yes. In a main Metroid game, the isolation is one of the key things that makes the game what it is. But this is a spinoff, and its an opportunity to see things from the Federation point of view...it's quite interesting, because in the later games we learn groups within the Federation aren't good people. I also heard this game will be taking place around the events of Hunters, and i'm sure Tanabe mentioned something about Sylux. I hope that story is expanded on. I might try and replay Hunters before this comes out. But hey, I guess you could take that as a compliment..? Haha no worries We put it together as a celebration of Metroid's 25th anniversary. I'm really proud of it! The ending theme was one of the first tracks I wanted on the album, so I wanted something a bit epic and I wanted to make sure we referenced the extra part that hasn't been featured in any other arrangement. This looks better then I thought it would, from how the guy was talking I thought we were getting a New 3DS exclusive in this. Aw, I felt sorry for Mr. Tanabe-san. Nintendo don't often have to dedicate time to going "guys, I really love this! Honest!" Found some footage. Very strong reminders of Metroid Prime Hunters to these aged eyes. I quite liked Hunters, you know, and the second stick will hopefully make it much smoother to play than said Hunters. Slightly more up for this than before. Besides, I want to help make the game succeed, so it'd be one in the eye for anyone who signed the petition. It's still the the art style that I really dislike as everything else about it looks fine, the galactic federation troopers are basically stomping about in giant mechs & for me the cutesy/chibi approach makes that less appealing. Yeah, the art style doesn't sit right with me either. I know the chibi style is likely down to performance issues running off the 3DS, but it still looks off. I reckon it probably would have been better suited to the wii U but maybe they thought they were protecting the series by having a spin off on a hand held. When I look at them I get a Civ: Beyond Earth vibe and I really dig that. Alternatively, it's like Star Wars: The Clone Wars against the regular films. A different approach to the same universe due to a differing theme. Works for me! Personal taste is a funny old thing, isn't it? I'm not the biggest fan of a chibi metroid, but looking at Jas' pictures of the federation from other games... those are just the most generic space marines ever! I'm not surprised Nintendo weren't keen to do a game around them. Fair point but you could argue that they still done that though especially when chibi as a style is so overused.